was just coming into season. We were there in mid-November. Ann Vanderhoof in “Spice Necklace” is wild about lambi, the Caribbean term for conch (pronounced “konk” in the Caribbean). Still, it’s nothing more than a fancy name for a great big sea snail. Given my keen interest in native foods, it was nearly impossible not to give lambi a go. Initially, it was elusive. After much searching, I got my first taste of it in St. Lucia, at a local “jump up” in Gros Inlet. It came in the form of a BBQ kebob, slightly smoky, tender, and slathered in a delicious buttery garlic sauce. I didn’t consider it at the time, but the few times I’ve had snails, that’s how they were served. Guadaloupe is the least expensive we’ve seen. After my calamari fiasco, (click here to read about that) I wasn’t frothing at the bit to pay 19 Euros to experiment when I saw them for sale in Guadaloupe’s Pointe A Pitre fish market. 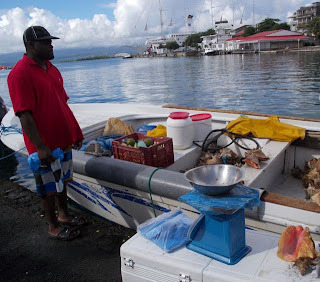 But I was willing taste a different preparation style in Nevis. Once again, they were swimming in a garlic butter, a texture a bit like a sautéed porcini mushroom. Good, but so rich, not anything I’d crave. 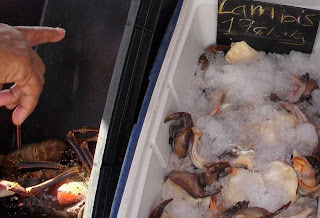 Wayne saw some lambi at our favorite hole-in-the-wall St. Maarten grocer and challenged me to buy and cook it. I was not entirely enthusiastic. “You didn’t take this trip to just make all the same stuff you could at home,” he chided. I felt obliged to pick take the gauntlet. I decided to tackle them with our newly purchased previously owned marine BBQ, trying to replicate my first taste of lambi. Thrilled to be able to BBQ, even if it is a tight fit. In the rapidly impending darkness, I balanced, with one foot atop the small space between the open lazerette that houses the propane canisters as the hose is coming out of one to power the grill, and the other atop the starboard lazerette, peering into the otherwise above eye-level grill. 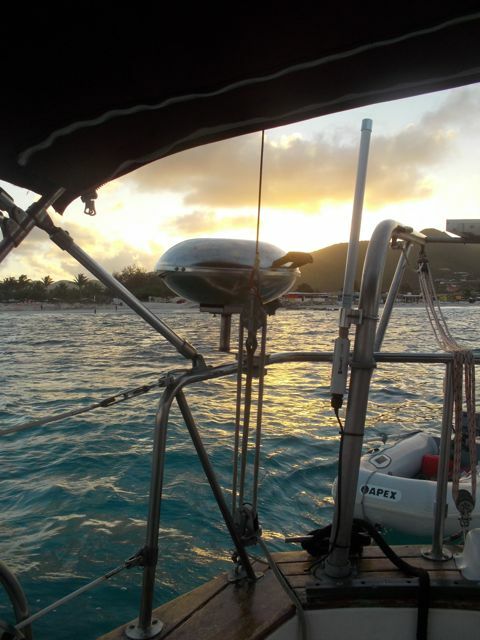 Looking at the grill from there requires a hunched back and a 45 degree head cant, the location carefully nestled to the left of our internet antennae booster and the right of our mizzen traveler, or left of the mizzen traveler and the right of the bimini support strut. Each allows less than one foot of unobstructed space. If feeling tippy – which is not uncommon due to swells and gusts -- it’s imperative to not touch our prominent yet fragile internet antennae booster. Wayne patiently lit and re-lit the grill when I discovered it went out three times. As the light shifted from impending darkness to dark, Wayne’s larger head better accommodated the stretched out elastic band of our headlamp, so he blissfully completed barbequing the marinated lambi skewers and the marinated steak and chicken breasts. 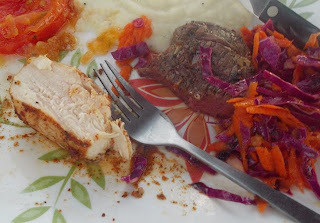 Steak & chicken from our new-used Magma propane BBQ. Likely to be more of this and less of lambi in the future. The chicken and steak were excellent; most, juicy, smoky. The lambi, well, I discovered I just prefer a lot of food that’s ½ to ¼ the price, even if it is less exotic. Is there some other preparation that would completely change my perspective on lambi? Perhaps. Dave Peoples of Jammin' (click here for their blog -- they're cruisers from the Portland area, like us, and we met in St. Maarten) makes a conch stew and I'd be willing to try with his recipe. But if it tastes just like chicken, then, well, chicken’s cheaper., unless we’re able and willing to catch and prep our own lambi. And you're a game galley wench for giving it a whirl - I've not even done that much - nor likely to in the future. Yup, it's one of those give a try to "check the box" then take pictures. That means more for others, right?